Earlier this year on February 26th our neighbor Amilcar Perez-Lopez was shot from behind and killed by plainclothes SFPD officers mere feet from his home in the Mission. His housemates were forced out of their home weeks after the shooting, part of the epidemic of displacement from gentrification & house flipping. One of them had lived in his home for over a decade. Neighbors and friends of Amilcar gathered in that home to eat together and support one another. Amilcar’s family is in Guatemala but other parents who lost their children to police violence showed up for him too, including La Mesha Irizarry and Refugio and Elvira Nieto. 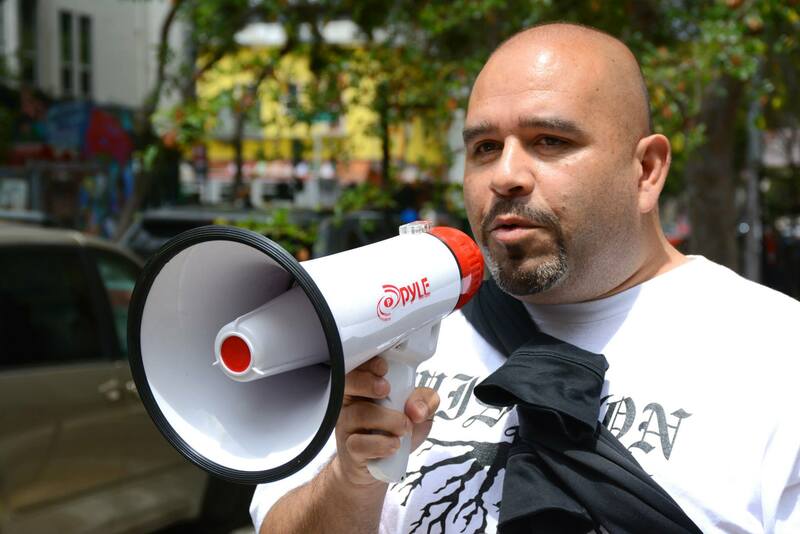 On July 24th, members of Justice 4 Amilcar noticed a unit in their old building had been advertised on craigslist – and the rent skyrocketed to over $4,000 for a two bedroom unit. 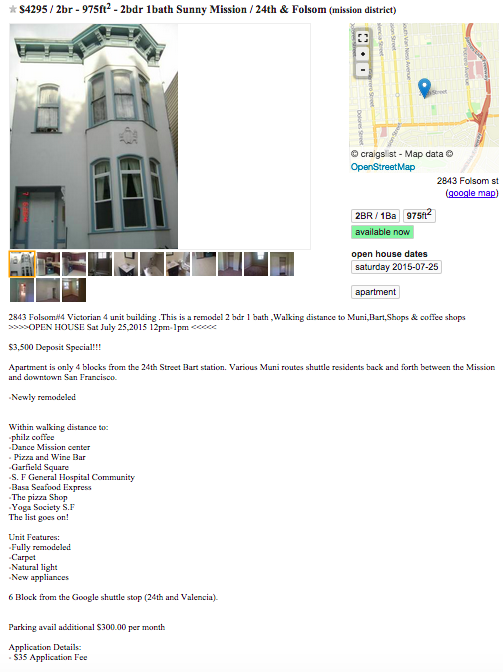 All over the Mission landlords have displaced locals to make room for gentrification. We want to let landlords know they can’t evict people and flip the apartment unscathed. We want to let the prospective renters that the old tenant was killed in front of that home by the institution meant to protect and serve him. 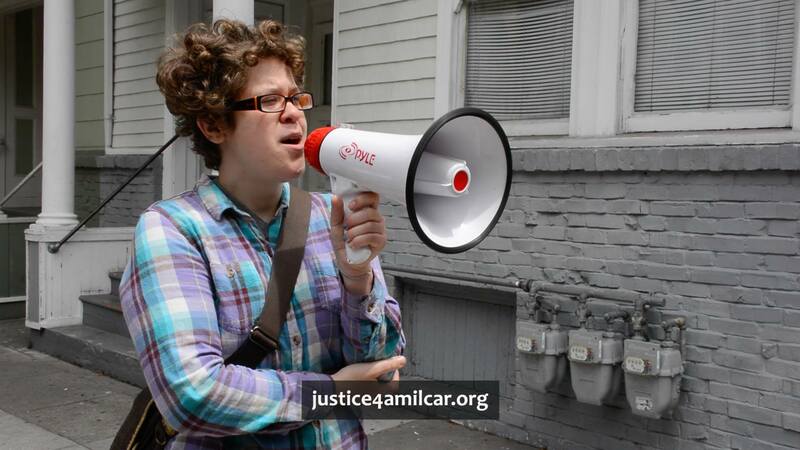 We want them to know the community will not forget Amilcar. The community gathered to express their outrage. Coverage of the action from Mission Local here. Please sign and share our Change.org petition HERE. English (ver la versión española de abajo). The San Francisco District Attorney, the California Attorney General, and the US Attorney’s office are all entities that have the power to file criminal charges. We call on each entity to file criminal charges against the officers that shot and killed Amilcar Perez-Lopez in the Mission District on February 26, 2015, and to file criminal charges against Chief Greg Suhr for covering up the facts of the killing of Amilcar. The official SFPD version of Amilcar’s death was originally that the officers “feared for their lives” because Amilcar “lunged at them”. However, an independent autopsy revealed that the six bullet wounds were all to the back of Amilcar’s body. The City Medical Examiner’s report was released just recently, and is consistent with this autopsy finding. Chief Suhr now admits that he was wrong but continues the cover-up. His new story is that Amilcar lunged at a bystander. Criminal charges should be filed immediately, based on seeing six shots to the back of Amilcar’s body, the blood on Folsom Street and not on the sidewalk, the lack of any evidence that Amilcar confronted the plainclothes officers or anyone else in the final seconds prior to his shooting, and Chief Suhr’s inability to tell the truth. Español El Fiscal del Distrito de San Francisco, el Fiscal General de California y el Fiscal Nacional son organos judiciales que tienen la capacidad de traer cargos penales. Estamos haciendo un llamado a estas agencias para que hagan representaciones públicas de cargos penales en contra de los policías que dispararon y asesinaron a Amilcar Perez-Lopez en el Distrito de la Mision el 26 de febrero de 2015, y de registrar cargos criminales en contra de Comandante Greg Suhr por encubrir la realidad del asesinato de Amilcar. La versión oficial de la muerte de Amilcar orginalmente fué que los oficiales de la policía “temían por sus vidas” porque Amillara “se lanzo a ellos”. Sin embargo, una autopsia independiente revelo que seis de los balazos penetraron la espalda de Amilcar. El estudio hecho por la oficina de el Médico Forense fue publicado recientemente y confirma lo que la autopsia relato. El Comandante Suhr ahora admite que él estaba erróneo pero continúa encubriendo a los protagonistas del caso. Su nuevo relato es que Almicar se le fué encima a otro peatón. Cargos criminales deben de ser introducidos inmediatamente, basado en los seis balazos en la espalda de Amilcar, su cuerpo en la calle Folsom y no en la acera como ellos dicen, la falta de evidencia que Amilcar confrontó a los policías o ninguna otra persona en los momentos antes que fue herido por balas y finalmente la incapacidad del Comandante Suhr de decir la verdad.